The Contours of American Politics takes a fresh look at the political culture of the United States. In its complexity and diversity, America fascinates. Its politics are brash and exciting, and its political impact upon the wider world is profound. This book examines not simply the mechanics of America's political system but also the ideas and principles that shape its values. Drawing on a diverse range of interdisciplinary material, the book maps the landscape of contemporary American political culture and identity. It surveys the nation's past as a critical and formative influence upon its present. It argues that religious beliefs, together with patterns of immigration and migration westwards across the continent, create the landscape of America's contemporary political culture. Roper examines the "politics of nostalgia" the roots of American democracy, and the framework of the federal government. Other topics covered include the nature of political power, the influence of the media, the stratification of American society in terms of race, class and gender, and the cultural sensibilities that underpin foreign policy. The Contours of American Politics is an excellent guide to the nation's political thinking, its attitudes and its political processes at the end of the "American Century" and at the beginning of the new millennium. It will be essential reading for undergraduates studying American Politics, American Culture, and International Relations. Jon Roper is Head of Department and Senior Lecturer in American Studies at the University of Wales, Swansea. 1 Lighting Out for the Territory. 2 The Politics of Nostalgia. 3 The Challenges of the Constitution. 4 The Framework of Government. 5 Playing the Political Game. 9 Back on the Raft. 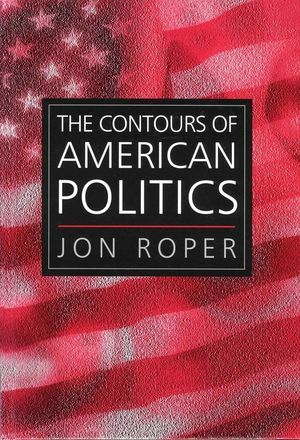 ‘Jon Roper's treatment of American politics stands as refreshingly different from the standard textbook on this subject. Roper has creatively integrated the essentials of the US political system with the persistent influence of the American historical experience and the often-overlooked impact of American cultural tensions. "Roper has produced a lively and entertaining book which not only covers all the essential factual detail needed for a student text but also provides fresh insight for the specialist as well". Michael Boyle. International Relations Theory.